I was provided with complimentary Ricky Ricotta’s Might Robot books to facilitate this review. The opinions in this post are 100% mine. 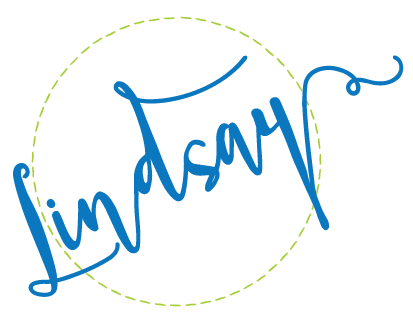 You can read my full disclosure policy here. My kids LOVE to read. I’ve been reading to them since before they were born and am so thrilled that both of them have developed a love of books. That love is definitely easier to foster when you find books that pique their interest, so I’ve always got my eyes peeled for something they’ll enjoy. 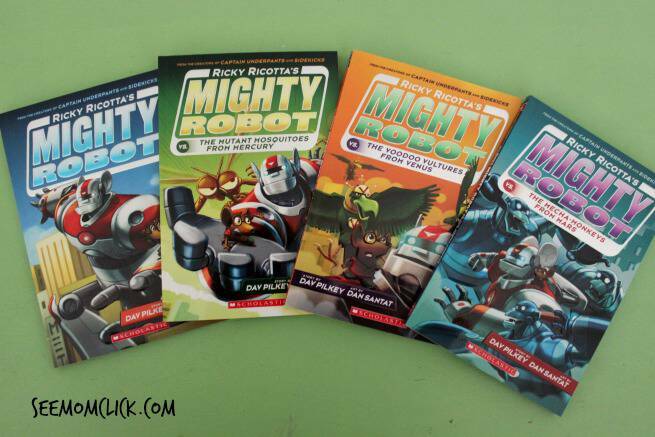 I recently discovered the Ricky Ricotta’s Might Robot series and my kids LOVE these books! My 5 year-old son is especially into them. From Dav Pilkey, creator of Captain Underpants, and acclaimed artist Dan Santat, an out-of-this-world friendship adventure with all-new full-color illustrations! First published in 2000, the new editions feature brand-new full-color illustrations and mini-comics throughout! Ricky Ricotta is a little mouse with BIG problems! Every day he is picked on by the neighborhood bullies. He lives in Squeakyville with his mother and father, and being an only mouse, he is often lonely. That is until SOMETHING BIG HAPPENS! A giant flying robot enters Ricky’s life and an unlikely friendship is born! Together, Ricky and his Robot must save the planet from a galaxy bursting with bad guys! Cute, right? My kids love this series! If your kids are at that intersection between little kid books and chapter books, these are PERFECT. They’re actually written as chapter books but the chapters are pretty short, just a few pages, and they have bright, colorful pictures on every page. 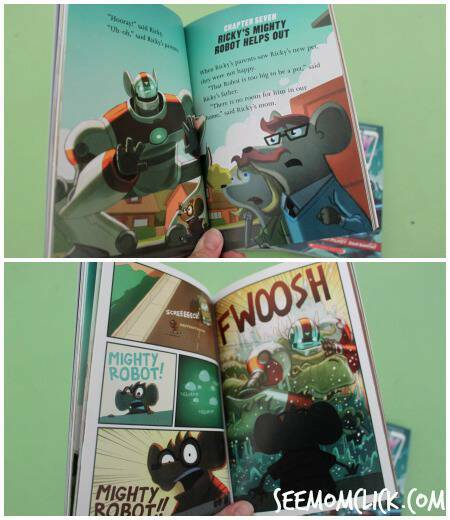 Not only that, each book includes mini-comic strips which are so fun for the kids. We get a lot of ‘kapow’ when we’re reading those pages! 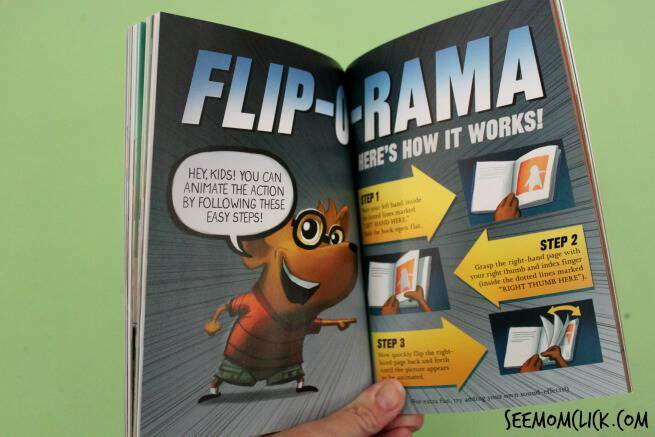 And toward the end of every book there’s a Flip-O-Rama where you can quickly flip through the pages to see an action sequence animated! We really love these books. They’re fun and exciting, funny, and the perfect length for my kids. You can find more of Ricky Ricotta on the official website and learn more about author Dav Pilkey too. Follow Scholastic on Twitter and Facebook to stay up to speed with all the latest news on this series and more! I am giving away the same 4 Ricky Ricotta’s Might Robot books that I was sent to review to one lucky reader: color copies of Ricky Ricotta’s Mighty Robot, Ricky Ricotta’s Mighty Robot vs Mutant Mosquitos from Mars, Ricky Ricotta’s Mighty Robot vs the Voodoo Vultures from Venus, and Ricky Ricotta’s Mighty Robot vs The Mecha-Monkeys from Mars. Yay! Your kids are going to love these. This giveaway is open to US residents ages 18+ and will end at 11:59pm ET on September 12, 2014. I would love to share these with my grandkids! They would totally enjoy these books. I would love to share these with my nephew. I think my son would love these. My 5 year old son would love these books! I would share these books with my students and personal children. My son is learning to read, and he would really love these awesome books ! I would share these books with my boys. They would really enjoy reading them. My children would love to read these books.